It’s a boiling hot summer day in a Louisiana sugar cane field once upon a time in the 1970’s. An overweight black man named Charlie runs for his life, yelling for help. And with good reason. There’s a white man pursuing him on a tractor with a shotgun. In desperation Charlie runs into a house as he simply cannot run any more. The white man gets off the tractor and strides toward the shack, shotgun at the ready and loudly proclaiming his intention to enter the house and kill Charlie. A shotgun blast comes from the house, killing the white man. The house is owned by Mathu (Lou Gossett, Jr.), an elderly black man who tells the younger one to make a run for it. Since we’re not shown who fired from the house we don’t know if it was Mathu or Charlie who did the killing but it hardly matters. As one of the characters says later on in the film; “Ain’t no colored ever kilt a white man in this parish and got away with it.” Even though it’s the 1970’s and still in the white-hot passion of the civil rights movement everybody who lives in the parish knows full well that things really haven’t changed all that much. Somebody’s going to get lynched over this. Mathu lives on land owned by the Marshall family and it’s Candy Marshall (Holly Hunter) who concocts a plan to save Mathu from certain arrest and the probable lynching: she sends out a call for all of Mathu’s equally elderly friends to fire off their shotguns and bring them along to Mathu’s house. She also calls for her fiancé, journalist Lou Dimes (Will Patton) to come to Mathu’s house to document what happens next. And it could get bloody. The white man who was killed was a Cajun and his father Fix (Stocker Fontelieu) intends to see to it that the man who killed his son pays for it. Stuck in the middle is Sheriff Mapes (Richard Widmark) who started the day intending to go fishing and certainly didn’t plan on having to deal with this mess. Because each one of Mathu’s seventeen friends proclaim loudly and with finality that they were the one that did the killing and here’s the just fired shotgun to back it up. And each one of those seventeen friends have brought along more shotgun shells as they don’t intend to see their friend lynched. A GATHERING OF OLD MEN is a movie that is so far under the radar it isn’t funny. I remember seeing it on CBS just once way back in the 1980’s and I’ve never seen it aired again on network television. 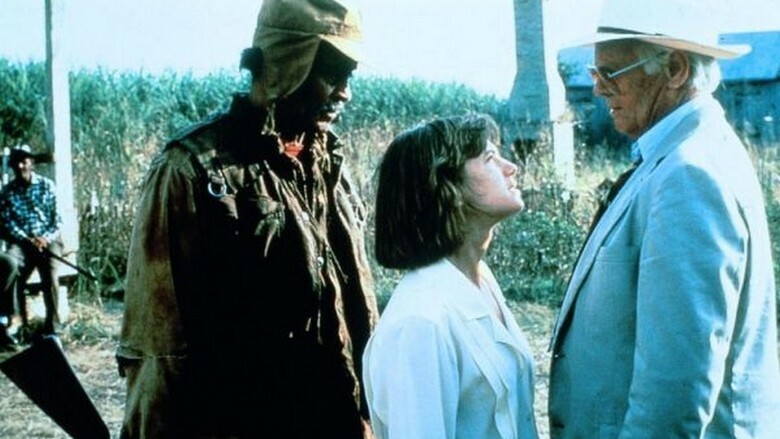 Which is a shame because it’s a powerful piece of filmmaking with outstanding performances from Richard Widmark, Holly Hunter and a cast of classic black actors such as the late great Joe Seneca, Woody Strode, Tiger Haynes and Julius Harris. 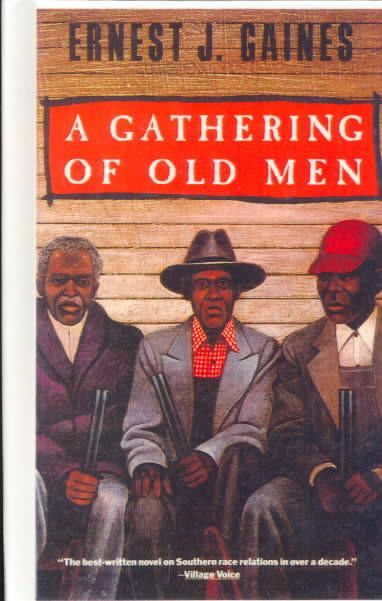 It’s a story exploring the desire of black men in the twilight of their years having one final chance at regaining their manhood and standing up for themselves. It gets even deeper into the various attitudes of the white characters who all have their own agendas regarding the black characters. The Cajuns want blacks to “stay in their place” so that they have somebody to feel superior to. The Marshall family are guilty of patronizing the blacks and believing they are superior to Cajuns which they despise for being “poor white trash” The patronizing attitude of the Marshalls is brought out sharp and clear in a scene when Candy proudly proclaims that these are “her” blacks and they “need” her to protect them from “those” white people. Was this a made for TV movie, Derrick? I’m pretty sure it was. I saw this for the first time in many, many years on a ENCORE channel (DirecTV gave us a free weekend) and I’m fairly certain this was a made-for-TV project as so many movies back in the 80’s were. Especially movies dealing with a subject matter such as this which at that time would have been considered unprofitable for theatrical release. The thing that’s always struck me as funny is how so many of the made-for-TV movies of the 70’s and 80’s were released as theatrical features overseas and did very well. Steven Spielberg’s classic “Duel” did fantastic box office overseas. If memory serves me correctly, it was such a success overseas that Universal put up more money, asked Spielberg to film some additional scenes and then released it theatrically here in the U.S.